Born on 1 June 1900 (put 1898 on attestation form) in Tumridge, Kent, England - son of W.D. Wood, 8th Canadian Mounted Rifles, CEF - at the time of his enlistment in 1916: present address in Gananoque, Ontario; trade as farmer; single; no current or previous military service; Methodist; height of 5 feet 4 inches; chest of 35 inches fully expanded; fair complexion; blue eyes; light hair. 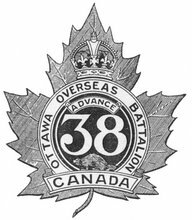 Joined the 156th Battalion, CEF, in Gananoque, Ontario, on 7 February 1916 (number 639508) - taken on the strength of the 38th Battalion, CEF, on 24 May 1917 - invalided sick to England on 22 August 1917 - kept in England as a "minor".